In this article, we will show you, How to write a C Program to Merge Two Arrays with example. 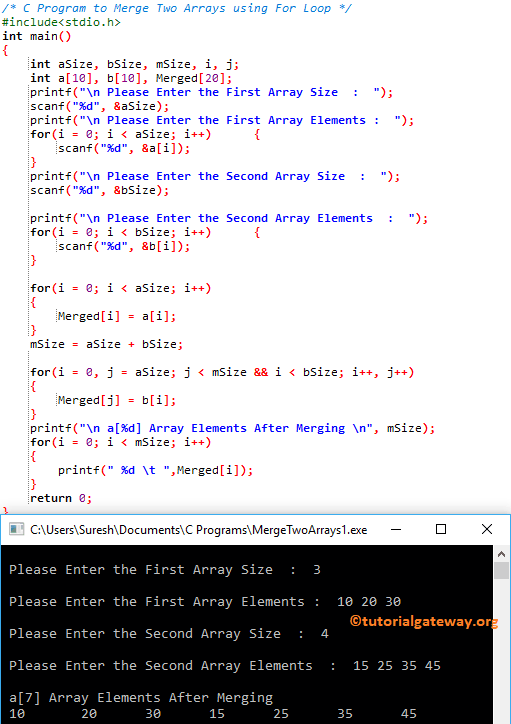 Before going into this C Program to Merge Two Arrays example, Please refer Array in C article to understand the concept of Array size, index position etc. This program to merge two arrays in c ask the user to enter the Array size, Array elements of two different arrays. Next, it will merge two arrays one after the other using For Loop. In this merge two arrays in c example, below For loop will help to iterate each and every cell present in the a array. Condition inside the for loops (i < Size) will ensure the compiler, not to exceed the array limit. The condition (3 < 7 && 0 < 4) is True. The condition (4 < 7 && 1 < 4) is True. The condition (5 < 7 && 2 < 4) is True. The condition (6 < 7 && 3 < 4) is True. Next, we used one more for loop to print the output. I suggest you to refer Print Array Elements article to understand this for loop.